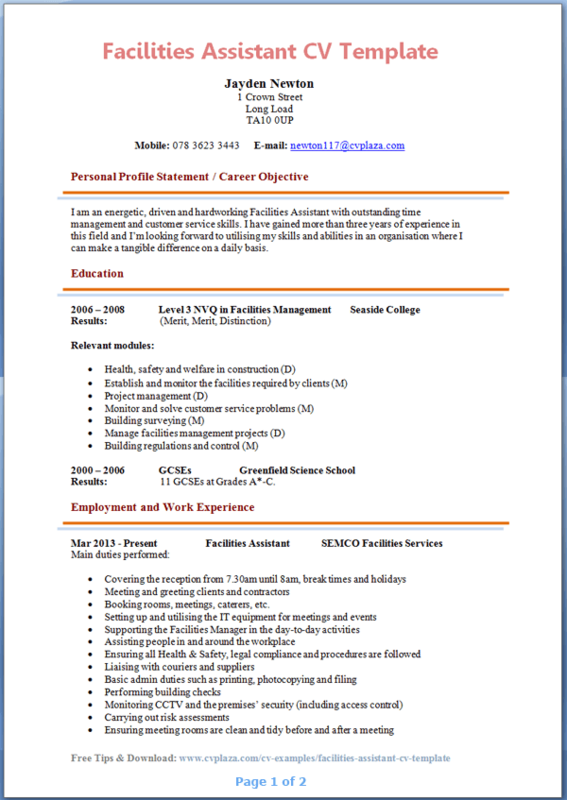 Tip: Use the Facilities Assistant CV Template below as an example to help you write your own personal and fully-tailored CV. I am an energetic, driven and hardworking Facilities Assistant with outstanding time management and customer service skills. I have gained more than three years of experience in this field, and I’m looking forward to utilising my skills and abilities in an organisation where I can make a tangible difference on a daily basis. Booking rooms, meetings, caterers, etc. Dec 2012 – Apr 2013 General Building Assistant Belem Housing Ltd. Calculating and comparing costs for required goods or services. I find myself to be an outgoing and friendly individual; I love socialising, meeting new people and volunteering at local Community centres. I also regularly go to the gym to keep fit and healthy. Site Manager, Belem Housing Ltd.
CV with no experience? The good news is that this job is an entry-level position which usually doesn’t require a lot of work experience. In fact, many vacancies clearly state that no previous experience is required and that “full training will be provided.” Having said that, it’s always best to re-arrange the sections of your CV so that it is more focused on your education, skills and achievements rather than your employment history. This job involves a lot of physical, hands-on activities and therefore you would want to portray yourself as someone who is active, fit and physically able to deal with all the duties that a Facilities Assistant needs to undertake [read: utilise the Hobbies section for this].